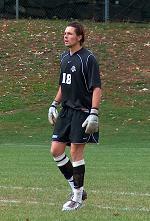 Long-time Jersey Shore Boca veteran goalkeeper Chris Konopka helped the Providence College men’s soccer team record a 1-1 double-overtime tie with Ivy League foe Yale on Sunday. With the tie, Konopka and the Friars remain undefeated on the season with a 2-0-2 record. It marks the first time Providence has been undefeated through the first four games of the season since 1993. NEW HAVEN, CT – (September 11, 2005) – The Providence College men’s soccer team recorded a 1-1 double-overtime tie with Ivy League foe Yale on Sunday, September 11 at New Haven, Conn.
With the tie, the Friars remained undefeated on the season with a 2-0-2 record. It marks the first time Providence has been undefeated through the first four games of the season since 1993. Yale’s Tyler Guse registered the first goal of the game in the 41st minute when he kicked in a shot in front of the goal after a scramble for the ball. With 7:36 remaining in the game, Yale was poised to add an insurance goal as Gage Hills broke in on Friar junior goalkeeper Chris Konopka (Toms River, N.J.), but Konopka, a long-time Jersey Shore Boca veteran, made a sliding stop on the 1 vs. 1 breakaway and robbed Hills of a goal to keep Providence within one. Providence gained momentum from the play and added the equalizer with just 2:36 left in regulation. Freshman Tim Ritter (Weston, Mass.) scored the Friars’ only goal when he booted in a cross from sophomore Ryan Maduro (Bristol, R.I.). The Friars had several scoring opportunities in the two overtime periods, but could not get a shot past the Yale goalkeeper. Konopka recorded four saves on the day and improved his record to 2-0-2 on the season. In four-hundred minutes of time between the pipes this year, the standout keeper has only allowed 2 goals, made 20 saves and recorded two shut-outs including a 2-0 win over Sacred Heart on Thursday at Providence. The 6’4’, 210lb Konopka holds a 0.45 goals against average and .909 save percentage after four games. Konopka was a member of the Jersey Shore Boca U20 team this past summer that advanced to the semi-finals of the United State Adult Soccer Association U20 Regional Championship as well as the semi-finals of the Mid-Atlantic Summer Showcase League (MSSL) Cup Championship. Providence will return to action on Friday, September 16 at Louisville at 7:00 p.m. in the Friars’ BIG EAST opener.